HURST, TX — Newly released dash cam video shows the exact moment a house in Texas explodes after a car drove into a home, hitting a gas line. According to the Hurst Police Department, on Saturday, April 7, police and fire personnel were dispatched to a home on Myrtle Drive after receiving reports of a vehicle crashing into a home. One of the residents was reportedly trapped in a bedroom. Video shows several officers arrive on the scene at the same time, and as they were walking up to the residence to assist, the house suddenly exploded in a massive fireball which lifted the roof from the structure and blew out most of the back wall. rubble. They pulled her outside to safety while getting her husband and son outside away from the house. occupants of the house were transported to area hospitals for treatment. The mother and father were reported to have serious burn injuries and are still under hospital care, and the son was treated and released for less serious injuries. The names of the residents are not being released due to privacy concerns, police say. released from a local hospital for injuries he received from the initial explosion, and Corporal Ryan Tooker was treated and released at the scene for cuts and abrasions received while assisting victims in the house. Investigators say that the explosion was likely due to the accumulation and ignition of natural gas inside the house, which was caused when the vehicle crashed into the house and severed the primary gas line and meter that supplied the residence. Police say that the vehicle was driven by 35-year-old Alejandro Enriquez-Castro. Castro, a nearby Hurst resident, was arrested at the scene for a misdemeanor charge of No Drivers License and transported to the Hurst Jail, where bond was set at $180. 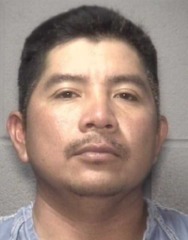 Police say that Castro was found to have several unconfirmed alias names and was placed on an immigration detainer and transferred to ICE this morning. Hurst Police investigators are still in the process of determining the causative factors that contributed to the initial vehicle crash into the house.